The World Council of Churches and the Taizé Community came to birth in the same period, Taizé at the beginning of the Second World War, the Council shortly after its end. In the mid-twentieth century, their respective initiators were animated by the same passion for Christian unity. They had the vision, for the divided Churches, of a new period that had to begin, a period of communion and fraternity among Christians, to foster peace on earth beyond the conflict that had torn the world apart. In their wake we try to keep alive this flame of unity. I am happy then, in this anniversary year of the Ecumenical Council, to assure you that we, the brothers of Taizé, are close to you. We thank God for the work you do, and we pray that the Holy Spirit will continue to guide you along the ecumenical path. Willem Visser ‘t Hooft, your first general secretary, and Brother Roger, our founder, knew each other and were in dialogue since the 1940s. Throughout the decades, brothers of our community have collaborated in various ways with the WCC, whether for theological work or in the area of the search for justice and peace. Brother Roger took part in the General Assemblies of Uppsala and Vancouver, and I myself in the last two, Porto Alegre and Busan. 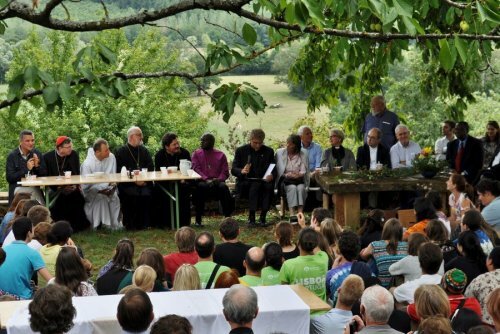 The geographical proximity between Geneva and Taizé has allowed many contacts; most of the Secretaries General of the WCC have visited us more than once. Your own trips to Taizé have made us happy, and I was very touched by your welcome during my visit to Geneva with brothers and young people. I say to you, dear Olav, and to all the staff of the World Council of Churches: happy anniversary! And also: let us continue our common journey!